Malaysia’s Prime Minister had an eye on an audience at home while striding an international stage in Sydney at the weekend. “Cak!” says the Malaysian meme circulating on Twitter since Monday. The Malay expression is often used with children, and means something like “Surprise!”, or, better, “Peekaboo!” In the background is a press photo from the ASEAN-Australia Special Summit which took place in Sydney on the weekend. In the photo, a smiling Malaysian Prime Minister Najib Razak stands shaking hands with an equally cheerful Australian Prime Minister and welcoming host Malcolm Turnbull. The meme also features, and is a response to, an interview broadcast on ABC television’s The World the day before the summit, during which Malaysia’s former prime minister, now opposition leader, Mahathir Mohamad argued that Turnbull “should stay away from him [Najib]”. A few days before the interview, The Australian newspaper had run a prominent story in which Turnbull’s son Alex claimed to have distanced himself from an international financial scandal Najib has not been able to disentangle himself from, although the case is now closed in Malaysia. The scandal, named 1MDB after a state development fund from which more than US$4 billion was found to have disappeared in 2015, is now the subject of a major investigation in the United States. 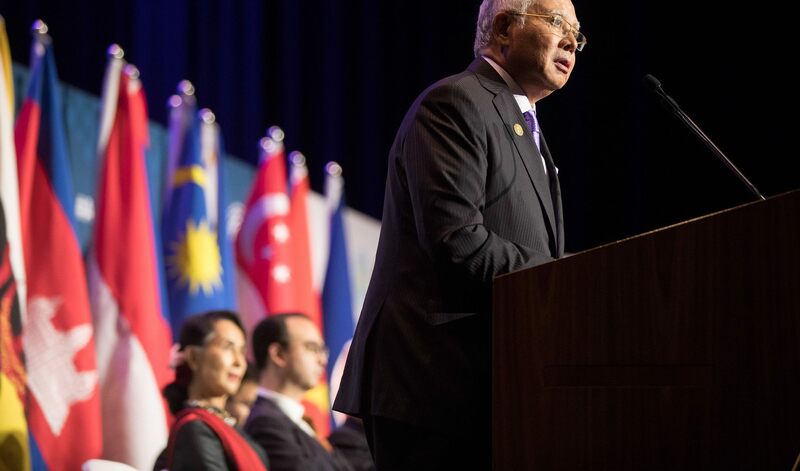 Memes, images, reports, and audio recordings featuring Najib’s actions at Sydney’s ASEAN-Australia Special Summit are now circulating in Malaysia as part of an advance election campaign, presently undeclared but underway all the same. The “Cak!” meme, for example, is intended to portray Mahathir as bitter and out of touch, unable to stomach Najib’s ongoing acceptance by the international community, including leaders to whom Mahathir has appealed to directly to stay away. Najib’s feed also showed him giving the closing speech at the Counter-Terrorism Conference, part of the ASEAN-Australia Special Summit and an important platform for Najib to use to position himself as a leader on regional and global issues, which is precisely how Malaysia’s New Straits Times described him on Monday. Malaysia therefore stands ready to assist in finding a just and durable solution, just as we are cooperating with our neighbours in the peace processes in southern Philippines and southern Thailand. Najib is not simply “deflecting attention” from 1MDB, an explanation sometimes offered by casual observers of Malaysia. Nor is he simply courting the Pan-Malaysian Islamic Party (PAS), with which his government seems impelled to coordinate its tactics to ensure Mahathir’s opposition is electorally neutralised. In addition to these tactical plays, Najib has selected the Rohingya cause to continue the tradition of “Islamic World” diplomacy he has invested in throughout his prime ministership. To present his credentials in “ummatic globalism” to Muslim audiences both at home and abroad, in 2010 Najib sent an aid flotilla to Gaza, and in 2017 sent a similar flotilla to Myanmar. Whereas once Najib may have done this to present himself as Mahathir’s legatee – Mahathir himself perfected this form of globalism during his prime ministership – now he must do so to demonstrate that he is better than Mahathir, as Najib stated in a tweet on Monday. Indeed, Sydney offered Najib a far better platform than his 2017 visit to Washington, where without an official joint press conference, images and videos used by Najib’s staff on his social media channels lacked a sense of bilateral authorisation. His statement to Trump that Malaysia came to the US with a “value proposition” was quickly derided by opposition leaders watching the video at home. Najib’s speech, which he delivered at the Centre for Strategic and International Studies, was also only circulated in transcript form. Similarly, Najib’s subsequent UK visit and meeting with Theresa May did not deliver the same opportunity to present himself as an international statesman that his meeting with Turnbull did. In turn, Najib’s team in Australia seized the opportunity in a much more polished manner. Malaysia’s opposition will not be able to criticise this performance as easily. Najib’s peekaboo moment in Sydney demonstrates the extent to which the ASEAN-Australia Special Summit was not only Australia’s show, but also a stage on which all ten ASEAN leaders (including Rodrigo Duterte, who did not attend) played out their assumed roles before their respective domestic audiences. Australia’s role in Mindanao post-Marawi is a litmus test of its willingness and ability to do more in the neighbourhood to safeguard its interests.